Photographing a wedding in the Washington, DC, area in which the bride, the groom or both are getting married for a second time requires a very different approach from their wedding photographer than the one needed for a marriage celebration uniting two people who have never been married. The entire event tends to be more relaxed and casual, because many brides and grooms who get remarried prefer something simpler and less stressful the second time around. This means that the weddings are generally smaller, and there is typically a lot less spectacle. So instead of producing wide, expansive images of all the hoopla, a good wedding and engagement photographer will focus on closeup shots of faces and small scenes that communicate the emotions that the bride, the groom, their families and their wedding guests feel on that day. Because even though it is their second time at the altar, the commitment that the spouses-to-be make to each other is no less important and the love they have for one another is no less intense. The nice thing about a second wedding, from the point of view of capturing emotions on film, is that there are added layers of family dynamics for the wedding photographer to work with. Many brides and grooms who get remarried have children from their previous relationships, and those sons and daughter are frequently old enough to play key roles in the new marriage celebration. This leads to some very meaningful and beautiful photos of the bride or groom interacting with and sharing emotions with their offspring. And in the case of the bride featured in this image, it is sometimes even possible to get pictures of a bride or groom having a special moment with several generations of family. The lovely bride pictured here tied the knot in an intimate wedding ceremony at Top of the Town, a wedding venue in Arlington, Virginia, with one of the best views of the Washington, DC, skyline in the entire metro area. She and her husband-to-be got mostly ready elsewhere and arrived at the event location just before the ceremony began. The bride-to-be did still need to get into her wedding dress, though, and Top of the Town’s staff graciously found some space for her to do her final preparations. Her mother, her sister and her teenaged daughter crowded into the room to help zip up the dress, put on the veil and do some final primping. While they were fussing over their daughter/sister/mother, the bride started smiling and laughing at all the attention, and that is when we took this picture. As is often the case in great photographs, it is the small details that make this image so memorable. The way the bride is laughing, for example, and the obvious happiness written all over her face. The way that her mother is also laughing, which both mirrors and amplifies the emotions the bride is experiencing. 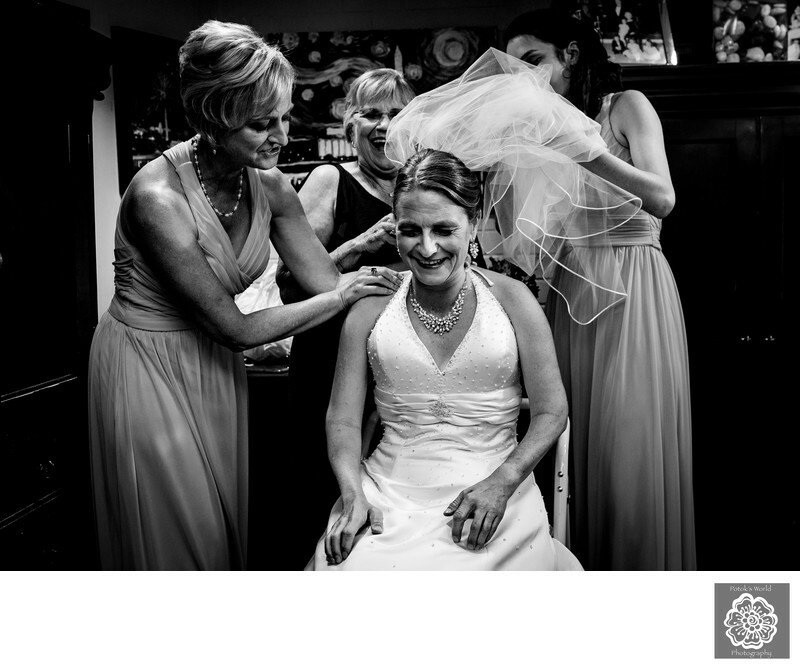 The way that the her sister is touching the bride’s shoulder, establishing a connection between the two and communicating nonverbally the familial love that they have for one another. And finally, the way that the bride’s daughter is fluffing the veil, which creates some nice dynamism in the shot. Location: Top of the Town Reception and Conference Facility, 1400 14th St N, Arlington, VA 22209.